Case Study: How effective are mobile containment units? As humans, we don’t always do what we should. Take, for instance, my new lifestyle change. I can usually convince myself to make a salad for lunch, but sometimes Jimmy John’s is just easier, tastier and more cost-effective. In other words, sometimes it’s easier to take the path of least resistance, even when we know better. That said, you’d be surprised how many of our clients don’t use the infection prevention tools they have available to them—namely mobile containment units. A lot of facilities own these units because they know they should be using them. But guess what. THEY’RE NOT USING THEM. Why? Because time. And money. And hassle. The fact of the matter is—sometimes you need some real, solid proof that changing your habits is worth the time, money and hassle. So I’d like to present a case study to show you just how effective mobile containment units can be—and why you should use them—even when it’s a little inconvenient. Stay tuned. It’s truly amazing how much of a difference these units can make. We were asked to perform a hazardous materials investigation in construction with a domestic water system upgrade in a government-owned healthcare facility. This is a pretty standard job for us. Sometimes, when it comes time to renovate or upgrade building systems there is a risk for hazardous materials to be disturbed. Our job is to go in, assess these risks and determine what action needs to be taken prior to/during renovations and upgrades to protect building occupants. In some cases, it’s a built-in hazard, like asbestos or lead-based-painted products. In other cases, it involves a developing problem like moisture, mold, bacteria and other biohazards. These building-related hazards are not always easily viewed or accessible. Sometimes they’re hidden behind walls, underneath flooring or above ceilings. Oftentimes we can guess if there’s something to assess based on when the facility was built/renovated; other times something just seems fishy. In any case, hospitals are NOT the place for guessing games. We were called in to figure out exactly what hazards were in play. In this project, some of the suspected hazards were located above ceilings (both hard ceilings and drop-in). That meant that above-ceiling areas would need to be accessed and disturbed. The biggest problem with this is that above-ceiling areas are ideal areas for dust collection, bacterial growth and moisture problems—among other serious issues. When you try to access these areas by, say, temporarily removing a ceiling tile, you’re not just disturbing dust, bacteria and other growths on that tile. You’re also opening up a passageway for all above-ceiling hazards to easily access public and patient areas. From there, dust and bacteria can spread all over the hospital—through hallways, on equipment and personnel, and through the HVAC system. This is what some would call an infection control nightmare. Knowing that above-ceiling areas would be disturbed, dust control and infection control particulate monitoring was requested. 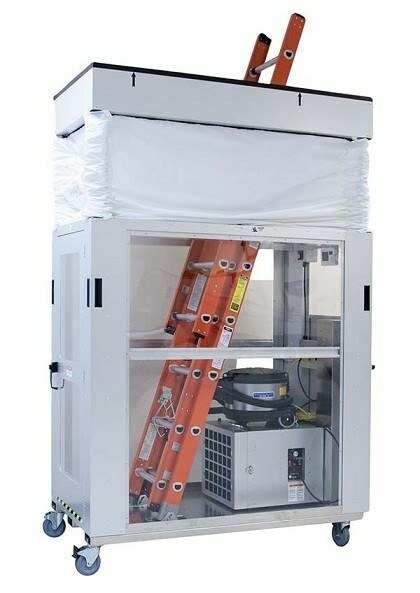 To tackle dust control, the facility purchased a mobile containment unit that would be used to contain dust at all times and points of ceiling access. 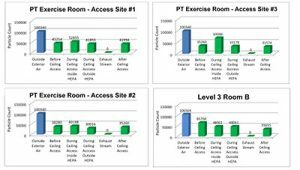 The purpose of this infection control monitoring was to identify any changes in ambient airborne particulate levels that might be associated with our accessing limited occupancy “service areas” above ceilings, walls and mechanical space. The overall goal was to monitor and prove the effectiveness of dust control using the mobile containment unit. Our job was to survey the asbestos-containing pipe insulation in the facility and other associated hazards. While some pipes were exposed, others are located above drop ceilings and hidden by hard ceilings. A mobile containment cart was employed for dust control during all assessment activities where above-ceiling areas needed to be accessed. This included multiple locations on four (4) levels of the facility. The unit we used was a hard-sided HEPACART™ brand cart with ceiling access (link to Mobile Ceiling and Wall Access Containment Unit). This unit was equipped with built-in High Efficiency Particulate Air (HEPA) filtration. and outdoors for daily comparison. The graphs below are just a sampling of the data we gathered during our particulate monitoringfor this project. This data represents particulate measurements taken in a large hospital space with multiple ceiling access areas over the course of one day. Please note that particulates were measured at .5 microns. For context on sizes of various particulates (dust, bacteria, mold, etc. ), take a peek at the graphic in this post. Access Site #1: Prior to ceiling access indoor particulate counts notably lower than outside measurements. This tells us there is not undetected infiltration of outdoor air into the space. During ceiling access, particulate counts rise due to exposed/disturbed particulates in above-ceiling spaces, but the outside particulate counts remain low. In fact, there are even few particulates in the space than before work was started. 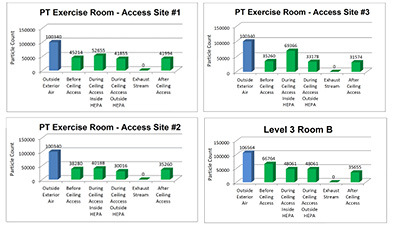 Access Site #2: Once again, particulate levels rise inside the HEPACART™ during ceiling access and remain low in the hospital space during and after ceiling access. During this session you’ll notice that there is an even more significant reduction in the number of particulates in the hospital space while the HEPACART™ is in use. 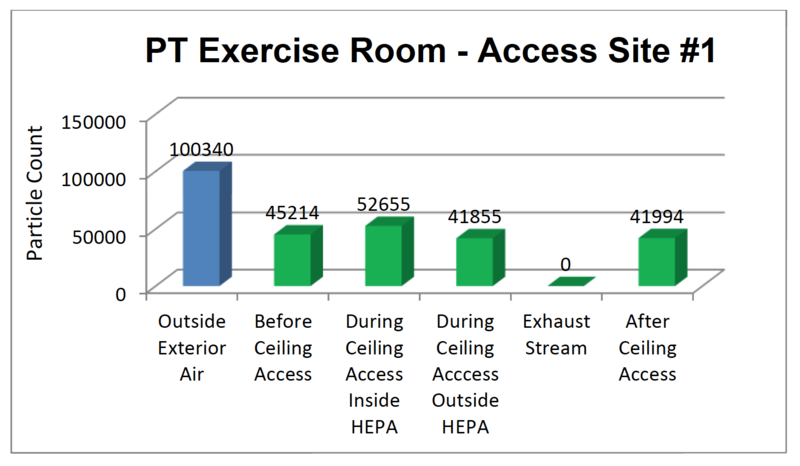 Access Site #3: During the third ceiling access session, a significant number of above-ceiling particulates were disturbed and released into the HEPACART™. Fortunately, once again, the mobile containment unit was able to contain these particulates and filter them out of the exhaust air, leading to fewer overall particulates in the hospital space when work was concluded. 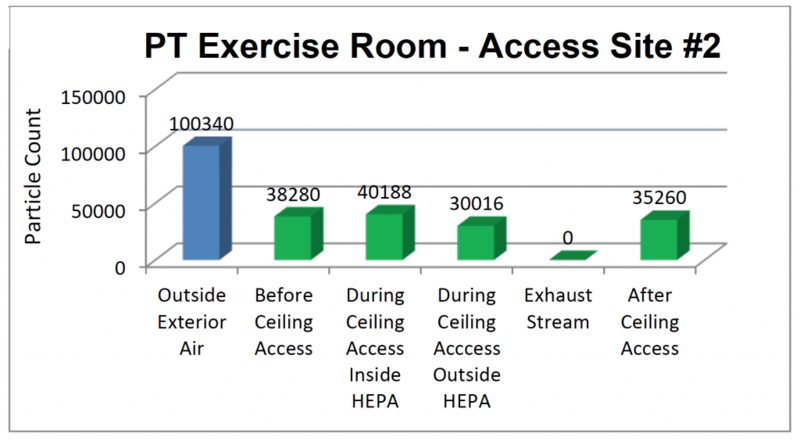 Before Ceiling Access – Particulate count in the room prior to ceiling access outside the HEPACART™. During Ceiling Access Inside HEPA – Particulate count inside the HEPACART™ that contained the work area during ceiling access. 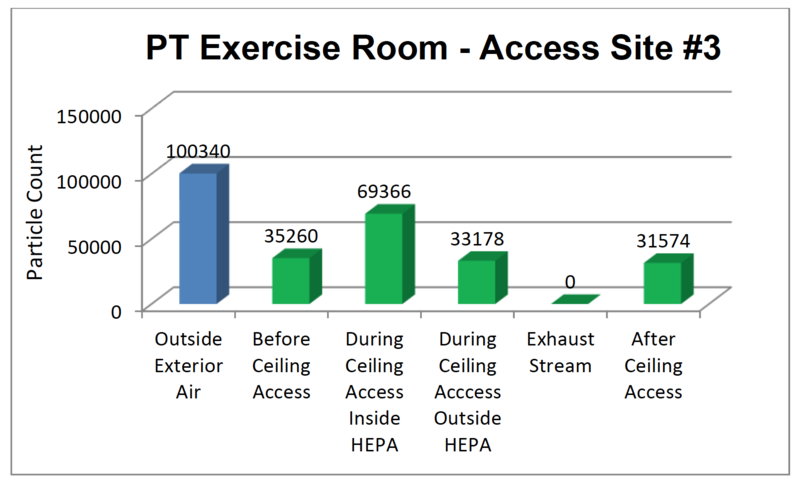 During Ceiling Access Outside HEPA – Particulate count in the room, but outside the HEPACART™ during ceiling access. Exhaust Stream – Measure of particulates exhausted into room from HEPACART™ filtration system. This measurement remained at zero (0) for all dates/location of data collection. After Ceiling Access – Particulate count in room outside HEPACART™ after ceiling access work was concluded. All particulate air samples were collected in accordance with standard hospital Infection Control Risk Assessment (ICRA) documents as well as the CDC’s “Guidelines for Environmental Infection Control in Health Care” as related to construction activities, industry standards, and AMI’s Infection Control Protocols (ICP) and experience in healthcare projects. Data is great, but let’s get down to the real results of this study. There are two clear conclusions we can make. Conclusion #1: The HEPACART™ effectively controlled dust and particulates during ceiling access. Conclusion #2: HEPACART™ use resulted in lower particulate counts (i.e. cleaner air) in hospital spaces. Let’s dive into this second conclusion, because it is actually an unintended happy side effect of HEPACART™/mobile containment unit use. The data shows that particulate counts were actually lower after work was concluded than they were before work began. Why is that? 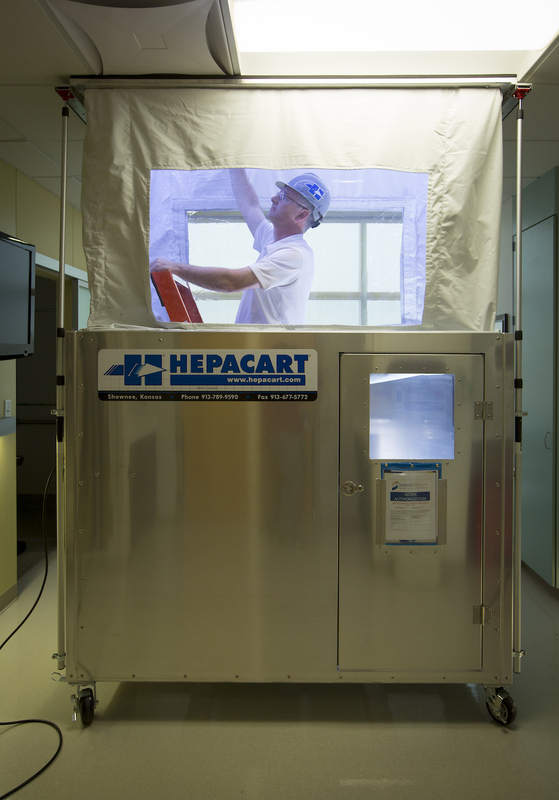 Well, to effectively contain dust and particulates inside the work area, the HEPACART™ was set to have a slightly negative pressurization effect—meaning that all air inside and just outside the HEPACART™ would be pulled inside for cleaning. This air was sent through a “HEPA scrubber” (i.e. HEPA filtration), meaning that while particulates were going in, they weren’t coming out. Note that zero (0) particulates were measured in the Exhaust Stream. The result? A cleaner hospital space overall. The overall goal of airborne particulate monitoring was to monitor and prove the effectiveness of the mobile containment unit at controlling dust during assessment activities. To review, our work was performed prior to demolition for the project, so there were no other dust control methods in use. In other words, it was very important that the mobile containment units do their job. So did they? YES. As you can see from the graphs, airborne particulate counts were lower after ceiling access in nearly every case. This result was achieved time and time again. In instances where particulate counts were higher following ceiling access, the difference was negligible. So what can we take away from this? First, the results are in and mobile containment carts are extremely effective at controlling dust and other hazardous particulates. Second, the extra time and hassle associated with using a mobile dust containment unit are, in fact, worth it when the data is this convincing. Not only can you rest assured that your patients and staff are safe, but you have scientific evidence to show that you approached and carried out the work in a responsible manner. What Methods Can Be Used for the Disposal of Infectious Waste?